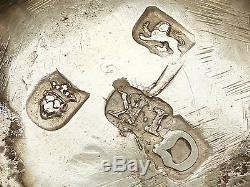 Sterling Silver Presentation Cup and Cover - Antique George III. 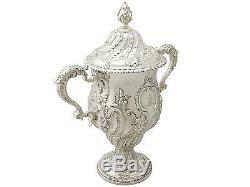 This magnificent antique George III sterling silver cup and cover has a campania shaped form to a spreading pedestal foot. 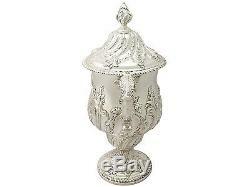 The lower portion of this silver presentation cup is embellished with exceptional chased alternating bead and fluted ornamentation, all in swirl design. The fluted decoration terminates with large chased scrolling leaf designs emanating towards the upper portion. 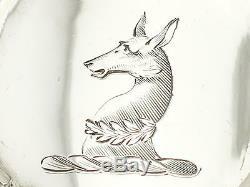 The decoration to the body incorporates a large shaped scroll bordered cartouche embellished with the contemporary bright cut engraved crest of a doe's head couped collared with a branch. 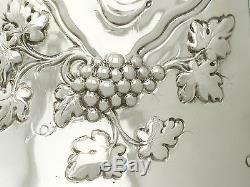 The posterior surface of this presentation cup bears a chased decorated fruiting vine design with suspended grape clusters and trailing scrolling leaf decoration. 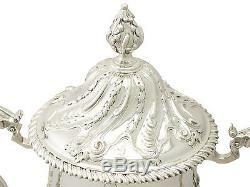 The cup retains the original hallmarked push fit domed cover encircled with chased fluted and scrolling leaf bands in a swirl design, terminating with a paralleling scroll and leaf decorated border. The cover is further ornamented to one side with the aforementioned crest to the body. 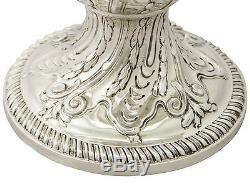 This impressive cover is surmounted with an exceptional sterling silver bulbous finial embellished with further fluted and leaf ornamentation. The rim of the cover is encompassed with an applied gadroon decorated border. This imposing Georgian cup is fitted with two impressive scrolling handles, each with exceptional leaf decorated thumbpiece and scrolling designs to either side of the handpiece. This magnificent example of Georgian silverware is supported by a pedestal foot encompassed with further chased decoration, in addition to a gadroon decorated border; this ornamentation is identical to that of the cover. By virtue of its size, this versatile cup could be used as a champagne cooler or a magnificent presentation cup. If required, this antique cup could be supplied with a bespoke ebonised black plinth with sterling silver plaque or band, suitable for a personal engraved inscription. This service would take approximately 6 weeks, whereas the cup can be dispatched separately prior to completion. 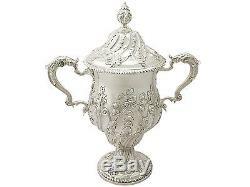 This antique silver cup and cover is an exceptional gauge of silver, exceptional quality and in exceptional presentation condition. 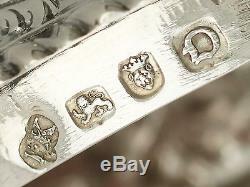 The chased decoration is all very sharp and the bright cut engraved crests are very crisp. 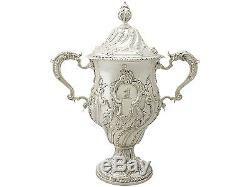 Full hallmarks struck to the surface of the cup and rim of the cover are all very clear; the hallmarks are struck deeply due to the exceptional gauge of silver. 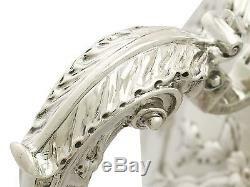 Reflections in photographs may detract from the true representation of this piece of antique silverware. Height to top of handle. Height to top of finial. We are dedicated to ensuring the highest possible quality service to our customers, always going above and beyond! See the tabs below to read more about our policies. Andrew Campbell founder and owner of AC Silver has been dealing in antique diamond & gemstone jewellery and antique sterling silver since 1977. In addition to his high quality Newcastle-based shop, Andrew has developed what is now an established and internationally recognised online store. For more details see our About Us. FREE OF CHARGE to all customers - including national and international deliveries. 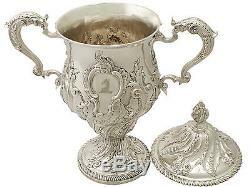 The item "Sterling Silver Presentation Cup and Cover Antique George III" is in sale since Wednesday, June 15, 2016. This item is in the category "Antiques\Silver\Solid Silver\Cups/Goblets". Dimenstions: Height to top of finial 37.7cm/14.8"